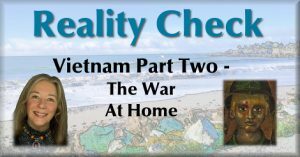 Recently we did a retrospective on Vietnam on Reality Check. This week in Part Two, we are looking at the war from this side of the ocean – the protests, the returning vets, the VA, the politics, and more. ‘The War At Home’, this week on Reality Check on KCIW.